Join us for an experiential and informative talk on incorporating herbal medicine into your lifestyle through learning the energetic of plant medicine. This is a continuation of the learning the basics of herbal medicine talk – and we will be covering different herbs through accessing our senses and taste. This talk offers gems for new and seasoned herbalists alike! We will discuss some back-to-nature home remedies and effective herbal medicines will be an opportunity to ‘sample the flavours’ of some gentle herbs during this talk (so bring a spoon and a drinking mug!). Copies of The Good Living Guide to Natural and Herbal Remedies will be available for purchase for $ 25. Katolen Yardley, MNIMH, RH (AHG) is a medical herbalist and nature knower with over 20 years of clinical and herbal medicine making experience in private practice in Vancouver, BC. She enjoys providing usable tools for optimal health through inspiration and education. She is the author of the “Good Living Guide to Natural and Herbal Remedies” (August 2016) and current president of the Canadian Herbalist’s Association of British Columbia. She is a clinic supervisor at Dominion Herbal College and adjunct faculty at Boucher Naturopathic College and offers seminars to the general public. Visit www.katolenyardley.com for more information or join our Facebook page to stay informed of upcoming classes: Katolen Yardley, Medical Herbalist. This entry was posted in Herbal Recipes, Herbs, Uncategorized, Workshops & Seminars and tagged Herbal Education in Vancouver, Herbal Medicine Classes, Herbal Medicine Making Vancouver, Herbal Medicine Workshop, vancouver herbal medicine making, Vancouver herbal medicine making retreat, workshops and seminars on February 28, 2019 by Katolen Yardley. If you are curious about herbal medicine, passionate about learning ways of incorporating herbal medicine into your daily lifestyle and thirst for some tranquil time in peace filled nature; consider joining myself, Katolen Yardley, MNIMH ~ Medical Herbalist and Sharon Brown Horton for a fun, inspirational, information packed weekend – at our second annual Gambier Island Herbal Medicine Making retreat. Partake in a 2 day Medicine Making weekend while camping on an off the grid property. Learn what it means to be on an off-grid-property and understand the details of island life. majestic rainforest and meadow land. Take a water taxi to a stunning quiet Island to learn about herbal medicine making. Enjoy the local animals on property and the gorgeous view overlooking Howe Sound. Perhaps we will encounter some ocean life and sea lions on route! Collect medicinal and garden edibles for salad and enjoy a delicious lemon balm desert, sip on herbal tea throughout the day. Prepare herbal medicine recipes and learn how to incorporate various local plants herbs as foods and medicine. Join Katolen Yardley, Medical Herbalist & host Sharon Brown Horton for this informative workshop! Price Includes: 2 days of teaching from 10 am until after 5 pm. Vegan friendly dinner on Sat, Breakfast Sunday, Herb Salads on both days. Overnight Saturday camping (limited tents provided). Additional information shared at time of registration. An introduction to Herb identification, Plant family recognition and Wildcrafting considerations will also be covered. There will be an option to purchase Katolen’s recent book The Good Living Guide to Natural and Herbal Remedies for $ 25. Reserve the Date: Saturday June 24 & Sunday June 25, 2017 Rain or shine! Prepayment required. Space is very limited â€“reserve now. 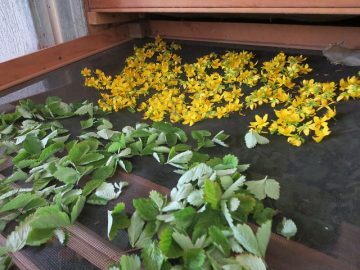 This entry was posted in Community News, Herb Conference, Herbal Recipes, Herbs, Workshops & Seminars and tagged Herbal Medicine Making, Vancouver herbal medicine making retreat on January 16, 2017 by Katolen Yardley.